The LS5700 series is similar to the two LED series above it although it lacks the Cinema 3D feature that higher tier models have. The non 3D picture is just as strong as the models above it with good color and black level performance and good off angle contrast. Colors on the 47LS5700 are displayed well with a nice, realistic look. Colors are not oversaturated and warm tones and flesh tones look particularly good. Contrast and black level perfomance on LS5700 is above average, the black bars on the top and bottom of movies are a dark inky black but in dark scenes the black can overpower some detail in the picture. The dark black does give the 47LS5700 its strong color rendition. The LS5700 did a nice job with motion processsing. 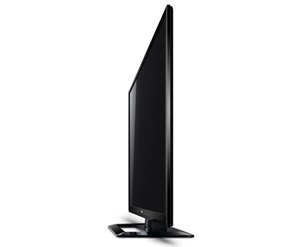 LG's LED televisions have had good off angle viewing performance in the past and the 2012 models are no exception. Compared to many LED edge lit models the LM5700 still looks good at angles around 35 degrees off center where the other will start to have the contrast degrade at 20-25 degrees. 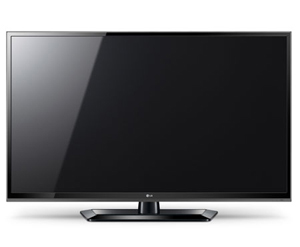 The 47LS5700 uses LG's 120Hz TruMotion, after much testing, we recommend locating this feature in the settings, tuning to the User setting and changing the Judder Reduction component completely off to 0, and Motion Blur at level 9 with the exception of sports programming or fast action in broadcast programming for which the feature actually adds quality. This tradeoff will produce lots of jerky judder but it's worth it. LG's Smart TV suite is also available on the 47LS5700 and includes the more than 1000 Apps the company now has along with the typical premium content channels some paid and some unpaid like Netflix, Hulu Plus, YouTube, MLB.tv, Facebook and Twitter. It's overall a very complete solution and enables lots of play time with unusual little Apps that users may or may not find worth the 3.99 cents to $5.99 that they usually cost. NBA Game Time:This App is found in the LG Smart World section and has mixed reviews scoring 2.5 out of 5. My guess is that many of those negative votes came from those that were not able to find the video highlights � which is not that easy. If you are into NBA basketball the App is very useful as you can access video highlights and statistics from every game played for the past week. MLB.tv is much the same format but has not been included yet. Rating: 3.5 out of 5. Youtube:Not only was the volume level excellent on many of the LG Smart TV offerings, we enjoyed this App a lot because once you select an artist you can just let the App roll through all that artists selections on You Tube. It's a nice App to have on as background music. Rating: 4 out of 5. Though it does not have the super thin almost non-existent frame of the Cinema Choice lines, this is still a nice looking TV with a half inch wide framing bezel of a rich black/charcoal color. Included with the 47LS5700 is LG's innovative Magic Remote, also called the Magic Wand Remote. This secondary remotes operates using motion control. To interact with your TV you point the remote at the screen and move a crosshair with you wrist to select items on the menus or in the Smart TV suite. We think it's a fantastic little gadget and are glad to see it being included in more of LG's series in 2012. The biggest advantage of this remote, having tested all manufacturers Smart TV functionality is speed when browsing the Internet (typing on the keyboard). Without Stand: 38.5" x 23.4" x 1.4"
At $730 you may be hard pressed to find a better TV in the market at the same price. There are not many 42 inch TVs being made now by top brands neither in plasma or LCD/LED. So, this is an excellent quality offering the 42 inch size and you gain 2 inch on offerings such as the KDL40EX640 series from Sony which sells for $170 more. You also get 2 inch on the Samsung UN40ES6100 which a good comp and sells for $70 more. I have to give the 42LS5700 a better picture, features and value rating (than its larger piers) based on the fact that it is one of the best quality 40 inch to 42 inch TVs in the market.